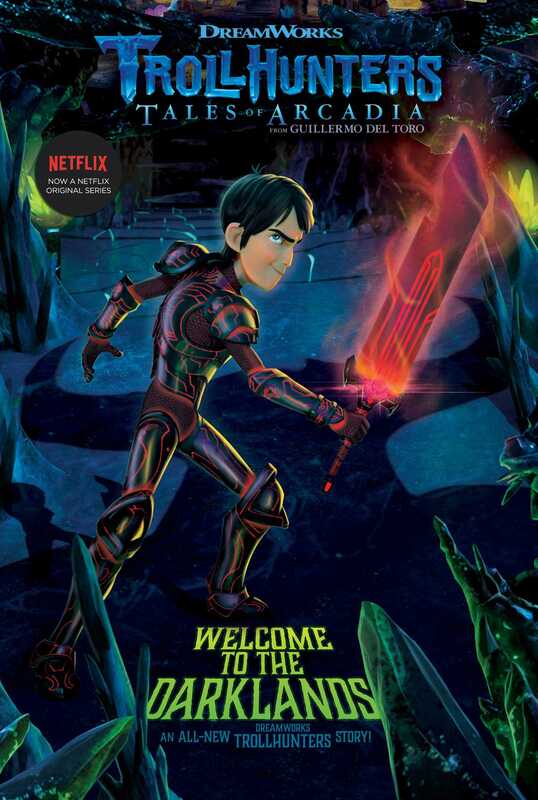 Two worlds collide in this all-new epic story based on the hit Netflix series Trollhunters—from the limitless imagination of acclaimed filmmaker Guillermo del Toro and DreamWorks Animation. Welcome to the Darklands, they’ve been waiting for you. After a reckless, anger-fueled act, Jim Lake, Jr., sets out on his own in a strange new world: the Darklands. Separated from his friends back home, Jim is discovering exactly what it takes to survive in this new realm as he encounters a whole new horde of Trolls. Back in Arcadia, Toby, Claire, and Blinky are doing their best to get by—and maybe, just maybe—find a way to reunite with Jim. This original exclusive Trollhunter story reveals what happens to these beloved characters between the season one finale and the season two premiere. Jim Lake Jr. entered the Darklands alone. The Trollhunter’s black-and-red Eclipse Armor protected him from the cold, but not from the faint echo of his friends’ voices. Looking back over his shoulder, Jim saw the rebuilt Killahead Bridge. Even though the portal under it had already closed, he could still hear his teammates on the other side, calling out to him. “Jim!” yelled Toby from the surface world. Jim took a deep breath and kept walking, trying to ignore them. But the Trollhunter’s next step faltered, when he heard one more distant voice. Jim wanted nothing more than to run back to the bridge, reopen the portal, and return to the warm safety of Heartstone Trollmarket. He wanted see Toby’s braces-filled smile again. He wanted to fist-bump all four of Blinky’s Troll hands. And more than anything, Jim wanted to look into Claire’s eyes. He wanted to tell her that he was okay, that deep down all this was for her—and her baby brother, Enrique, who had been stolen into the Darklands months ago. But the Trollhunter didn’t do any of that. Jim forced himself to tune out Claire’s plea. He marched farther across the Dead Plains, until he reached a cliff. Standing at the edge of the precipice, Jim looked out on the endless expanse of the Darklands. His disbelieving eyes beheld towering rock structures that intersected at odd angles, a low black sun that cast a sickly light over everything, and a mind-bending maze that seemed to stretch into infinity. The engravings in Jim’s armor pulsed with red power. A split second later, the Sword of Eclipse appeared in the Trollhunter’s hand. The black sword shimmered as Jim affixed it magnetically to his armored back. “Get ready, Gunmar,” Jim said out loud, even though he couldn’t see a single sign of life anywhere around him. Jim knew that somewhere down there, in the twisted heart of the Darklands, Gunmar the Black waited for him. And that when they finally came face-to-face, only one of them would survive the encounter. But Jim couldn’t worry about that just yet. Before he could take on Gunmar, the Trollhunter had to find someone else. Even though he projected as loud as he could, Jim’s voice hardly seemed to carry over the dead, flat air in the Darklands. Jim waited for a response, but none came. Jim took a step, then stopped. His brow furrowed as he thought about what he had just said. He looked over the edge of the cliff and wondered how he was going to climb down it. Jim suddenly found himself wishing he had bothered to pack a few supplies before jumping haphazardly through Killahead Bridge. He figured that stuff like a rope or compass or bottled water—or, heck, even a meatloaf sandwich—would’ve been kinda helpful right about now. Maybe the Amulet could have guided Jim to a safer path, just as it had guided him ever since he found it months ago, in the Arcadia Oaks dry canal. Jim still couldn’t believe how an Amulet created by Merlin—yes, that Merlin—had passed to Jim from the previous Trollhunter, Kanjigar, just as it had passed to Kanjigar from Deya centuries before that. But the Amulet wasn’t of much use to Jim now. He had had to leave it back on the other side of Killahead Bridge. That was the only way to make sure the portal would reopen for Jim when he returned. If I return, Jim thought darkly. He looked down at the empty space over his heart where the Amulet usually ticked—where it had unlocked new weapons for Jim, like the Eclipse Armor. Like the Sword of Eclipse. Like the . . .
“Glaives,” Jim said to himself, getting an idea. He held his hands by his sides, and two curved blades—the Glaives—magically appeared in his palms. Using them like a pair of pickaxes, Jim lowered himself down the side of the cliff, like a mountain climber going in reverse. As he descended, Jim’s mind couldn’t help but wander. Each time he sunk a Glaive into the rock, another recent memory flooded into the Trollhunter’s head. Jim thought of the hurt looks on Claire’s, Toby’s, and Blinky’s faces as he locked them out of the vault in Heartstone Trollmarket, which held the ruins of Killahead Bridge. Jim recalled how the Amulet then turned Jim’s armor from silver to ebony before magically reassembling Killahead and opening the portal. Even now, Jim still felt that stomach-churning sensation from when he had stepped through the swirling passageway and into the Darklands. He wondered what would happen when his mom, Barbara, woke up from the spell that made her forget Jim was the Trollhunter. Would Draal honor his oath to protect her? Could he even protect her? After all, Jim wasn’t worried about another attack from enemies like Strickler or Angor Rot. He was more concerned about how his mom’s heart would likely break when she discovered her only son had now gone missing. The Trollhunter mourned AAARRRGGHH!!! The soft-spoken Krubera Troll had saved Jim countless times, just as he had aided Kanjigar and Deya before him. But AAARRRGGHH!!! gave his life to save his friends, and now the gentle giant’s mossy body had been turned to solid stone. In AAARRRGGHH!! !, Jim and the others hadn’t just lost a teammate. They’d lost a friend. Jim pushed away all those painful thoughts as he finally reached the bottom. He stowed the Glaives back inside the onyx plates on his thighs and scanned the dim surroundings. That Changeling nursery has to be around here somewhere, Jim thought to himself. If I find the nursery, I find Enrique. And if I find Enrique, then I can find my way back home to Claire, Tobes, Blinky, Mom, and everyone else who doesn’t want to murder me. Jim shook his head in another attempt to clear his friends’ faces from his brain. The Trollhunter had committed to taking on this mission alone. That was the only way to make sure those close to him would never be in danger again. Jim had just lost AAARRRGGHH!!! He wasn’t about to lose someone else he loved. Turning a corner, Jim stepped into a clearing, and his blood froze. A Gumm-Gumm at his post stood before him, leaning against a wide ax that looked corroded from ages of neglect. Jim was about to reach for the Sword of Eclipse on his back when he noticed something. The Gumm-Gumm wasn’t moving. He hadn’t even reacted to Jim’s presence. In fact, the Gumm-Gumm almost looked like he was . . .
“Asleep,” Jim whispered to himself in relief. The Gumm-Gumm snored softly under his helmet. Jim tiptoed around the sentry, careful not to wake him. He had just crept behind the Gumm-Gumm’s back, when another fierce wind blew across the Darklands. The gale loosened some gravel on a stone shelf over Jim’s head. He watched with dread as the little bits of rock fell and clinked against the Gumm-Gumm’s helmet. Jim cringed behind the guard’s broad back, still unseen. Once again, he tried for his sword, but the metal plates on his armor tapped together as his arm moved. The Gumm-Gumm spun around and searched the space behind him. Fortunately, Jim jumped before the Gumm-Gumm could spot him, managing to stay behind his back. The Trollhunter timed his footfalls to land with the Gumm-Gumm’s and kept out of his line of sight. Jim didn’t move a muscle. Hearing nothing else, the Gumm-Gumm huffed in satisfaction. He leaned against his battle-ax and dozed off once more. The second Jim heard the lazy lookout’s snore return, he padded away as quickly—and as quietly—as he could. It was only after he was out of earshot that Jim remembered to breathe again. He exhaled visible clouds in the chilly air and shivered as he found himself in front of a labyrinth. “I wonder if this Eclipse Armor could unlock a blanket for me,” Jim joked to himself. All of a sudden, Jim felt warmth against his back. At first, he half believed that maybe the armor had given him a blanket. But when Jim turned around, he saw that the heat had nothing to do with him. It came, instead, from the large flying fireball that hurtled out of the darkness and toward Jim like a comet. Jim pulled the Sword of Eclipse off his back, held it in front of his body, and hoped like crazy that this new armor was fireproof. . . .